Why is it so difficult to get straightforward answers to three simple questions about climate change? Senator Steve Fielding, an engineer who understands the distinction between facts and fanciful computer models, recently posed three questions regarding climate change to Minister Penny Wong. The Minister, through her Department of Climate Change, provided answers to those questions based largely on advice from Professor Penny Sackett (Chief Scientist of Australia) and Professor Will Steffen (ANU Climate Research Centre). The “answers” often evaded the issues raised by Senator Fielding, and mostly discussed peripheral, if related, issues. The answers also shifted the usual goalposts, arguing, for example, that global average atmospheric temperature was not a desirable measure of global warming – despite its consistent use by the Intergovernmental Panel on Climate Change (IPCC) for more than 15 years. Rather, the Department now wants to use ocean heat content as their prime measure. A measured scientific audit of the Minister’s replies to the three climate questions was provided later by Senator Fielding’s four independent scientific advisers. Meanwhile, The Australian published an independent attempt to answer Senator Fielding’s questions by Professor Neville Nicholls. Professor Nicholls’ answers are as misleading as the Department of Climate Change’s were beside the point. 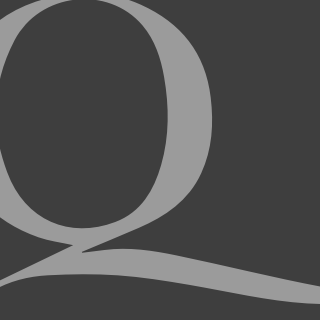 We wonder why it is so difficult for straight answers to be given to a few simple and direct questions. The regular scientific obfuscation that occurs regarding global warming issues is surely a major reason for the confusion that exists on the issue amongst public and politicians alike. 1. Has the world cooled since 1998, despite a five per cent increase in atmospheric carbon dioxide concentrations? Our Answer: The claim that the globe has warmed by about one-tenth of a degree Celsius over the last decade is extremely misleading. The date “after 1998” is carefully chosen to provide a desired conclusion, and in fact temperature trends have not increased continuously since 1998 as Nicholls’s words imply. A more accurate statement would be that the late 20th century temperature rise peaked in 1998, and that thereafter temperatures have decreased by about 0.1°C since 2003. 2. Is the late 20th century warming unusual and, if not, then why is the current warming a problem? Nicholls’ Answer: There have been warmer periods in the past. About 125,000 years ago, for example, temperatures were several degrees higher than today, comparable to the warming projected for the end of this century. Sea levels then were about 5m higher than today. A sea level rise of this magnitude could be a problem. Our Answer: Sea level change is a natural hazard which occurs at different rates and directions in different places in the world. Societies need to adapt to these changes, as the Dutch have long known. Cutting carbon dioxide emissions from Australia (or world-wide, for that matter) will not result in measurably different sea levels in the future. Furthermore, wasting money on ineffectual reductions in carbon dioxide emissions simply reduces the wealth available to adapt to climate and sea-level changes as they occur. In other words, emissions-reduction policies increase rather than decrease the risk of damage from natural changes. Furthermore, the reason that the large high latitude ice masses melted to contribute to a large sea level rise 125,000 years ago is that the amount of solar radiation received at high latitudes was greater then (some 15 times greater than radiative effects from doubling atmospheric CO2) than now because of the configuration of the Earth’s axis and orbit. 3. Do all IPCC computer models project a "steady" increase in temperature for the period 1990 to 2008? Our Answer: Professor Nicholls’ claim is incorrect, because it is based upon individual model runs that have no physical meaning. 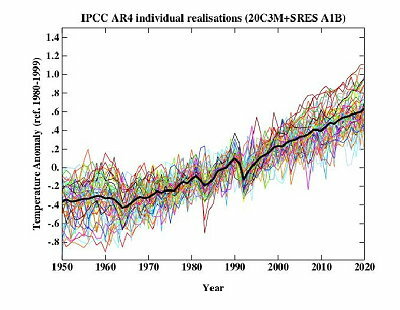 It is precisely because the individual runs have no statistical significance that the IPCC conducts discussion of this issue in terms of an “ensemble average” of individual model runs. The figure provided by Minister Wong in her reply to Senator Fielding’s question shows that, from 1990 through 2008, the model average predicts increasing warming, apart from a cooling dip around 1991-1993 that represents the modelled effects of the Mt. Pinatubo eruption. (3) Yes, all IPCC models did project warming through a ten year period when instead cooling occurred. Additional new research published over the last 5 years has added greatly to our understanding as to why solar radiation is such a strong modulator of climate change over different regions of the Earth. These results, and much other new research that bears on multi-decadal climate rhythms, provide valuable insights for the answers to questions (1) and (2) that were missed by Professor Nicholls, who preferred to appeal instead to authority and consensus paradigms – concepts that are quite foreign to science. Taken together, the correct answers to Senator Fielding’s questions indicate that the hypothesis of dangerous global warming caused by human carbon dioxide emissions is invalid. It follows that costly emissions trading legislation is at best pointless. Doubtless this is why it has been so hard to elicit clear statements on the matter from Minister Wong and her supporters. 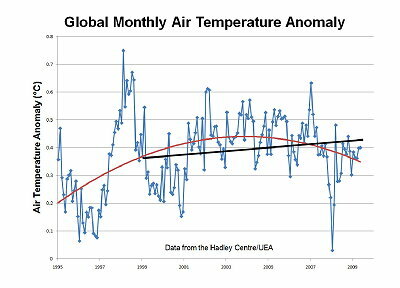 Plot of global air temperature anomaly since 1995. The black line is the linear fit from 1999 to 2009 preferred by Professor Nichols. More correctly, the red line illustrates that the rising temperatures peaked in the early part of the last decade, and have subsequently decreased by about 0.1°C since 2003. This figure, taken from Minister Wong’s reply to Senator Fielding’s questions, shows that from 1990 through 2000 the IPCC modelling predicted progressive warming as represented by the dark average line (the cooling dip around 1993 represents the effects of the Mount Pinatubo volcanic eruption). The individual modelling runs that are indicated by the network of coloured lines serve only to confuse, because individual runs do not have physical meaning. The lack of skill of this modelling exercise is illustrated by the lack of correspondence between the 1995-2008 portion of this figure and the real-world temperature history plotted in Fig. 1.